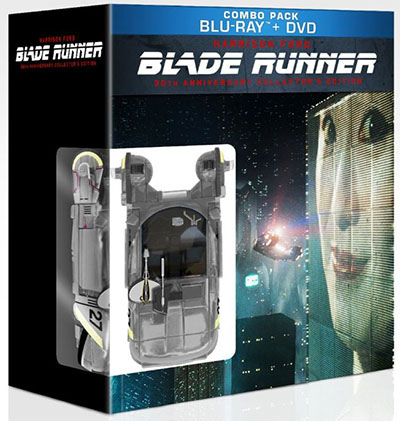 ‘Blade Runner: 30th Anniversary Collector’s Edition’ Blu-ray Announced and Detailed!!! Looks like I will have to purchase ‘Blade Runner’ yet again. This will mark the 5th time I believe. I will have owned the VHS, the DVD, The HD-DVD Briefcase, the Blu-ray briefcase, and now this glorious 30th Anniversary Edition. Whew. This blu-ray will be released October 30th, 2012. The blu-ray briefcase came out back in ’07, and it looked great, but compared to let’s say, The ‘Alien’ quadrilogy’ that was released recently, it’s no comparison. I’m pretty sure, or at least I hope that Warner Bros. is preparing a 4k restoration and a lossless DTS-HD audio mix. It’s going to be in a gift set again, but in my opinion, not as cool as the briefcase. Although it comes with a toy car from the film, booklet, and a couple other goodies. It’s up for pre-order below. This entry was posted on Thursday, July 19th, 2012 at 4:12 pm	and is filed under Film, News. You can follow any responses to this entry through the RSS 2.0 feed. You can skip to the end and leave a response. Pinging is currently not allowed. « ‘Lawrence of Arabia: 50th Anniversary Edition’ Blu-ray Announced!!! I've paid my price, in blood. And in broken dreams.